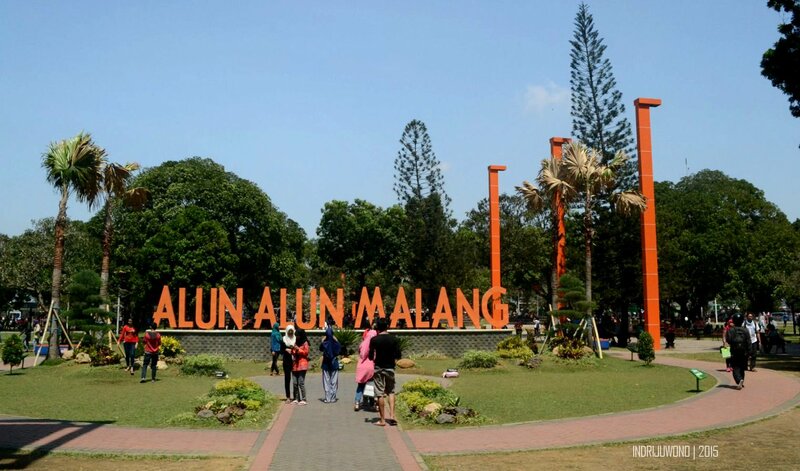 There is a memory that splendid while returning into the city of Malang. 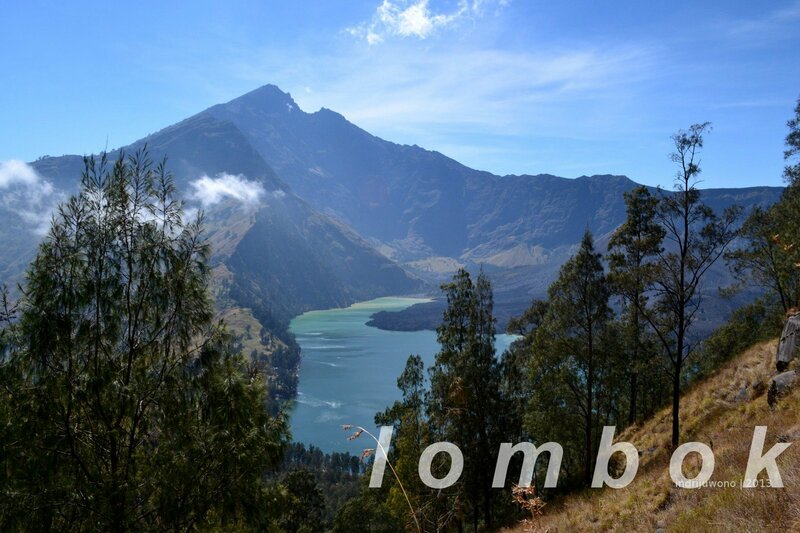 For me, Malang was holidays, because I’ve never actually lived here. 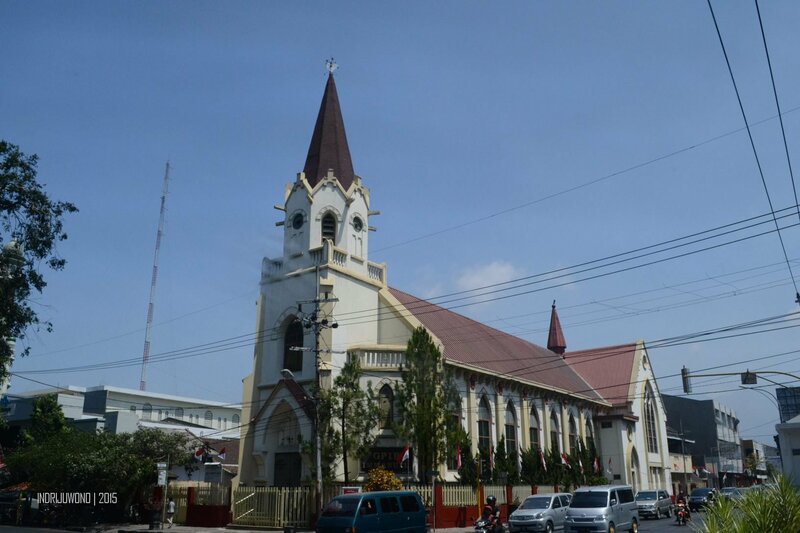 But turn back more than 25 years ago, I always visit Malang every month, not just passing by, but some frequently visit. When I took picture inside Ban Lam Wine & Bar at Tugu Hotel Malang, Pak Bagus, manager of the hotel just ask, “Why don’t you just try Malang City Tour Bus? 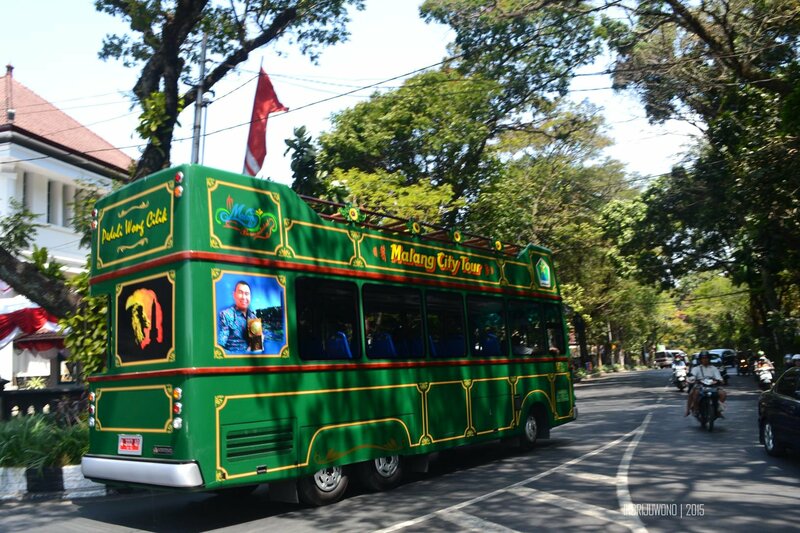 It would be easily to travel around the old town of Malang.” Gasp, suddenly I was being attracted by the offer. Why not? 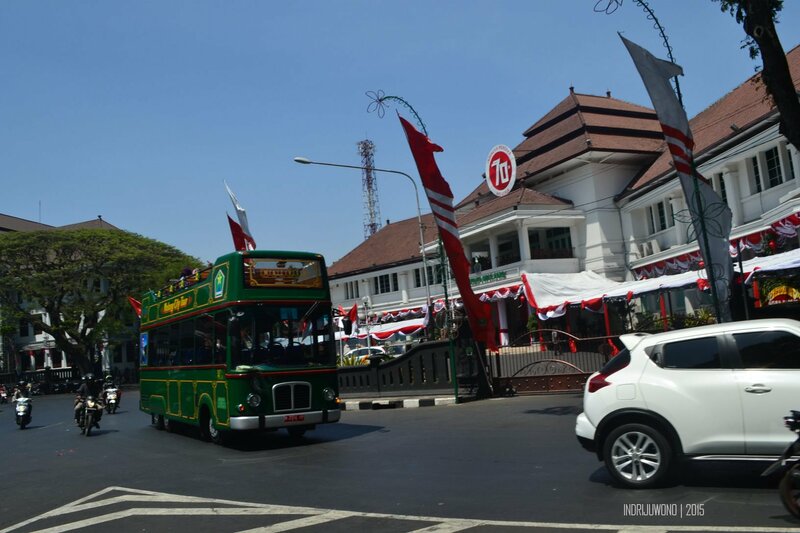 I never imagined that Malang had their City Tour Bus, just like Semarjawi at Semarang, or Bandros at Bandung or Jakarta’s Mpok Siti. He explained, “This is Sunday, the bus will travel around more often.” Hm, actually I planned to go to Batu that day, but I feel doubtful because I had heard that all the way to Batu would stuck on traffic within Sunday. “What if I take the bus next Tuesday, after I go back from Blitar?” I was still thinking. “The frequency of the bus will rare during working days. So you’d better take the bus today. 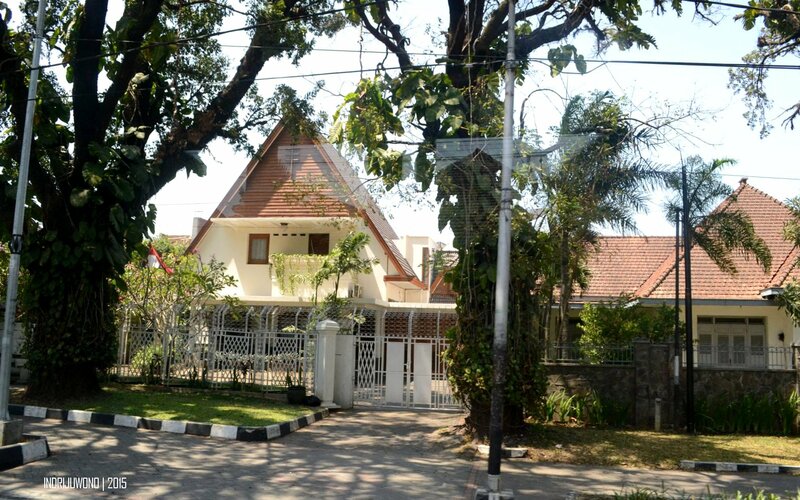 You can change your plan to Batu next Tuesday,” Pak Bagus said gently. “If you agree, I can call the bus driver to take you.” Sounds good, so I said okay and walked to the lobby while he took the phone to call. “He said the bus is at Ijen Street, near here. Maybe you can wait about 20 minutes,” Pak Bagus reported his conversation with the bus driver. 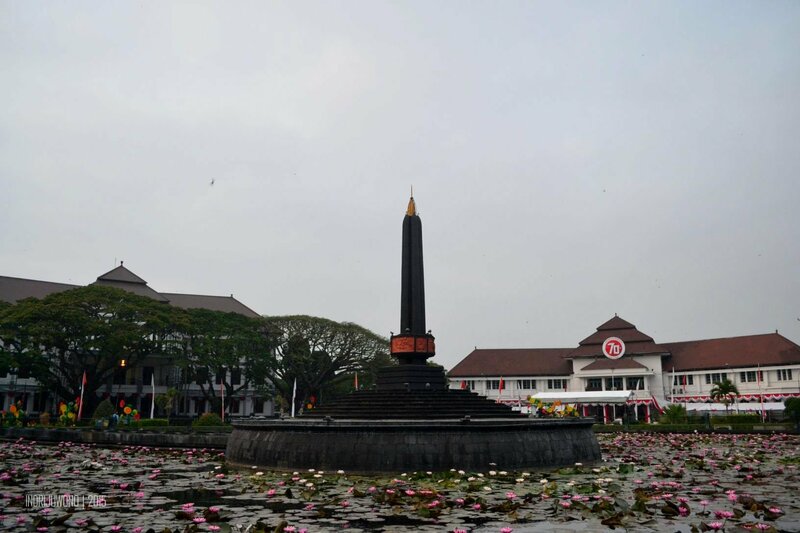 I took some photo around Tugu Hotel during my waiting time. 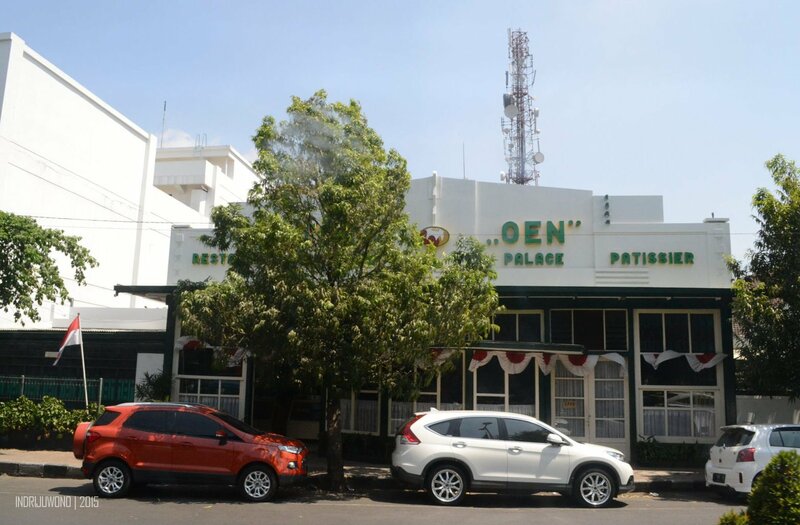 Fifteen minutes later, Pak Bagus showed me the bus that been parked in front of Malang Government City Hall which was seen from the hotel lobby. “You can walk there, and said that you were our guest,” he said. I walked accross the street and found there so many people were waiting their turn to go inside the bus. They showed their ticket which was sign up before by the land officer. 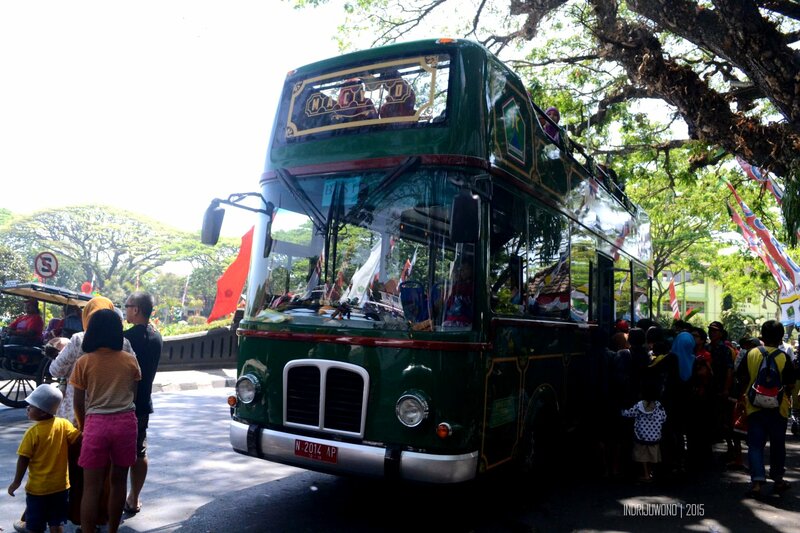 A few staff helped the queue.There was Malang City Tour Bus, a double decker green bus, lower floor cabin with air conditioned, and upper floor deck without roof which could be reached by the stair at behind. First I climbed the stair to upper floor deck, but all the seats were full. So I back down to the lower floor and took a seat, while the driver said, “This seat for the guest from Tugu Hotel.” I smiled to him, “Yeaa, I’m the guest. So I’ll sit here, right?” Those windows were big and clear, so I could easily took picture within the travel. 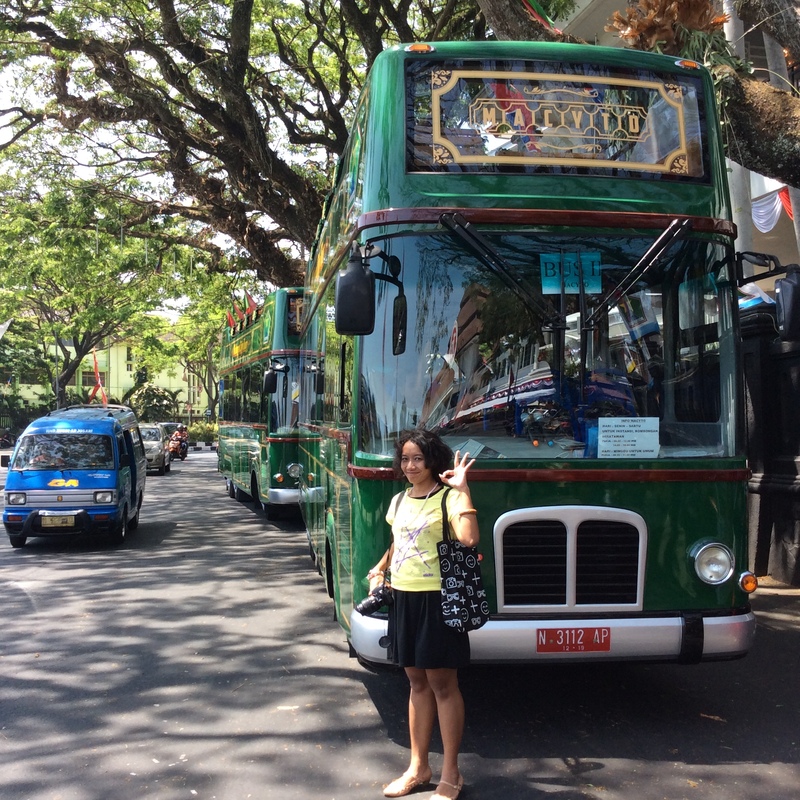 In a few minutes, the bus left the City Hall and turn to Majapahit Street where we found Bird Market. 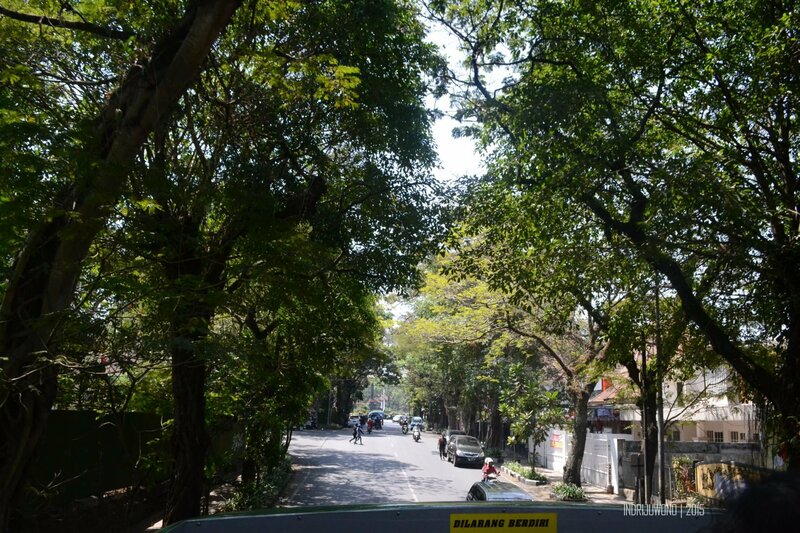 Many roads in Malang aren’t flat, so the bus were walking slowly down and up. 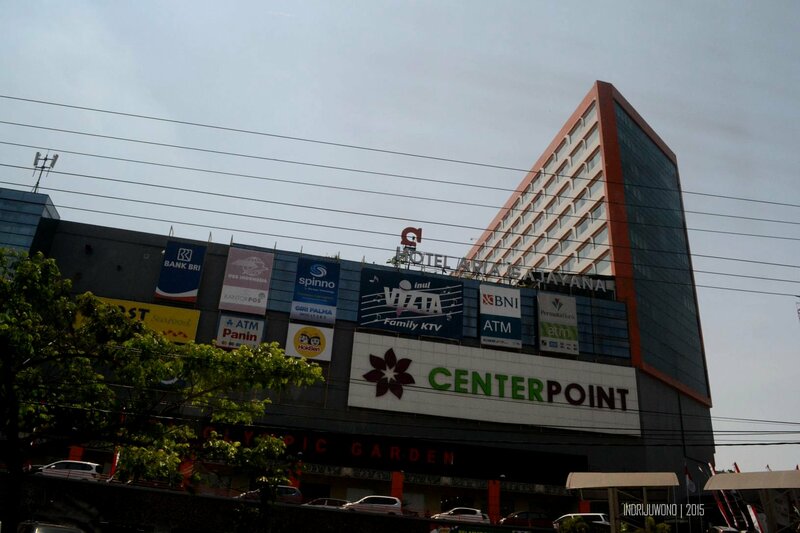 I was really happy when we passed Toko Oen and Gramedia bookstore, one of my favorite memories when I was at elementary school. Almost 26 years ago when I lived at Blitar, I always came to that bookstore choosing my favorite novel, and start my books collection. Gramedia only had one floor at that time. Because my parents always parked their car at Telkom office, the pedestrian between the offfice and bookstore are very familiar. Those memories had never gone away. 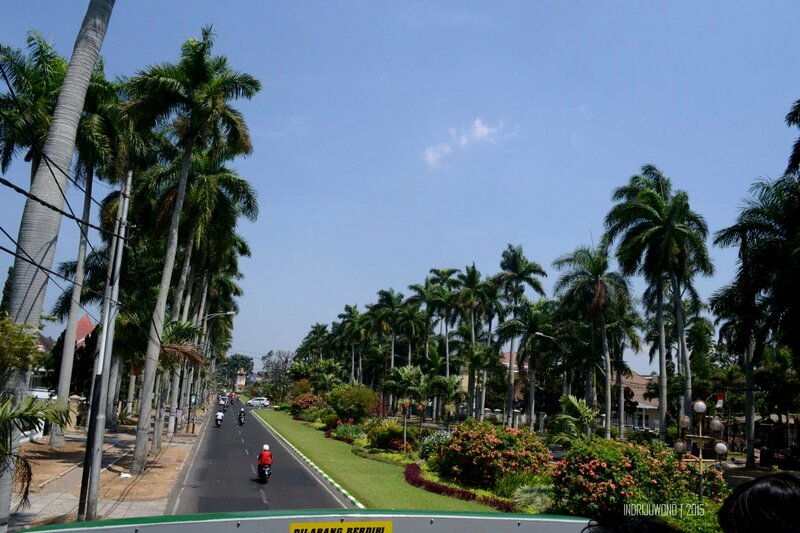 The bus turn around Alun-alun Kota Malang. Some old time memories grew in my mind. Me and my brother played here when we were so young (he just still toddler, I thought) at our holiday. Then our mother asked us to supermarket and bought some new clothes and we ate some snacks before my father drove back to Blitar. 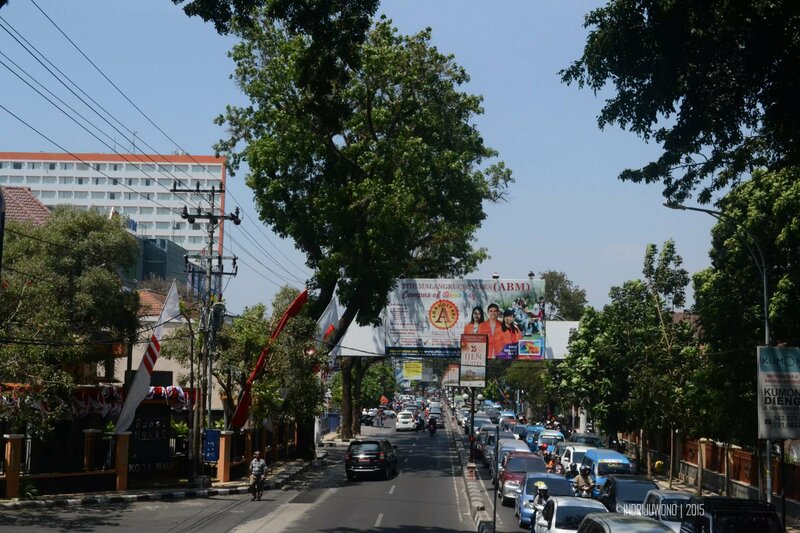 I didn’t remember Malang with its traffic at my earlier time, but there was some traffic when we pass Kawi street. Some building had changed become shop or big store and created noisiness there. So many car were queuing in the street before we turn left to Malang Old City, Ijen Street. I heard about Ijen Street in many news, mostly about architecture or urban planning. 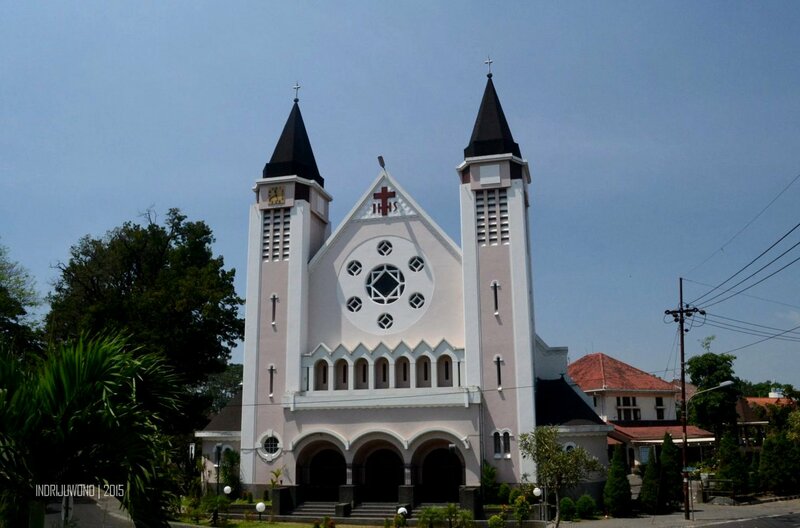 This part of the city was built by Thomas Karsten the famous city planner which designed Semarang and Bandung also. 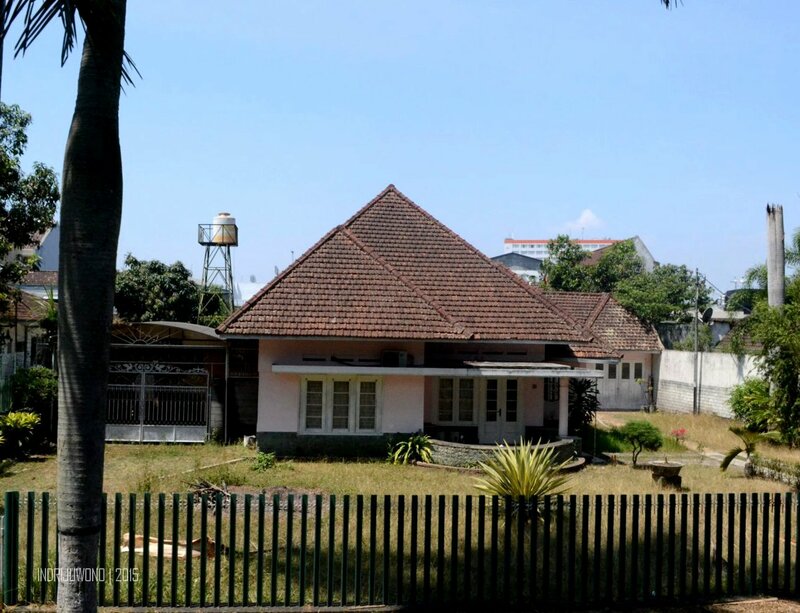 His plan at 1914 for Ijen Street was functioned as housing area. 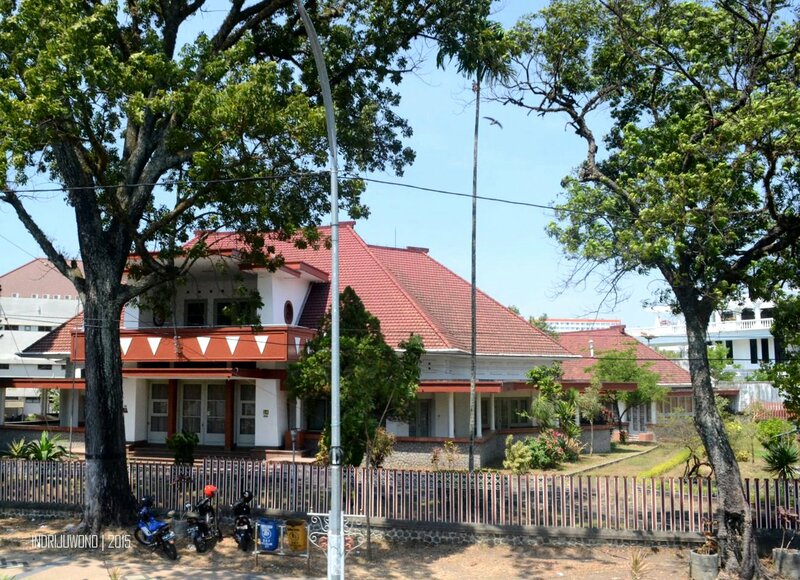 I saw some big house with Colonial Hindies Style. Those roof were slightly steep roof in a large yard. I thougt there must be some Dutch Officer which owed the house. As the housing area, this area also completed with school, church and hospital. I feel surprise when the bus stop at one circle and the driver said that we could change our seat, so I had a chance to sit at upper floor under the Malang sky! I got one and tried to feed my camera more pictures. Although the weather were hot enough, I just happy could easily mengamati architectural type at Ijen Street. Not too much trees which could cover through this boulevard but it was okay. Meanwhile at upper floor, I just recognised that a lot of electrical or telephone cable were passing over across street, and distracted the vista of the Malang City. Although it was still in tolerable height, but unsightly. 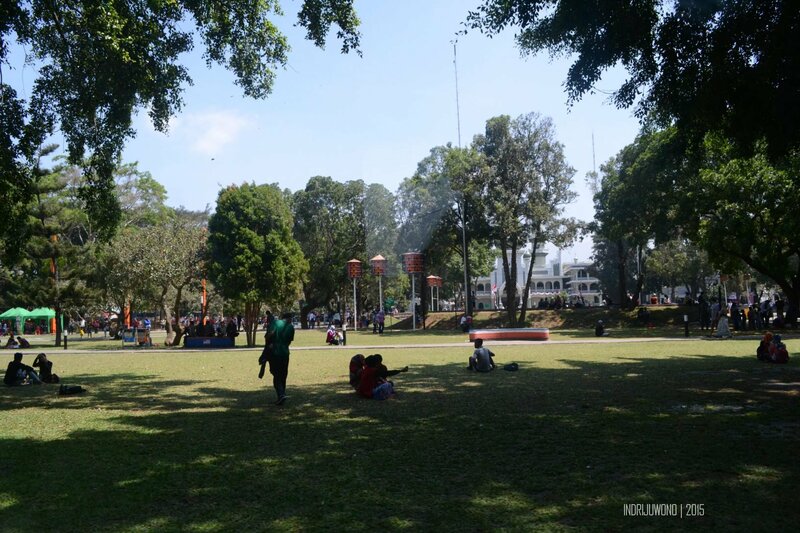 We’re back to Alun-alun Tugu again, where some passengers were waiting their turn to enjoy the trip. 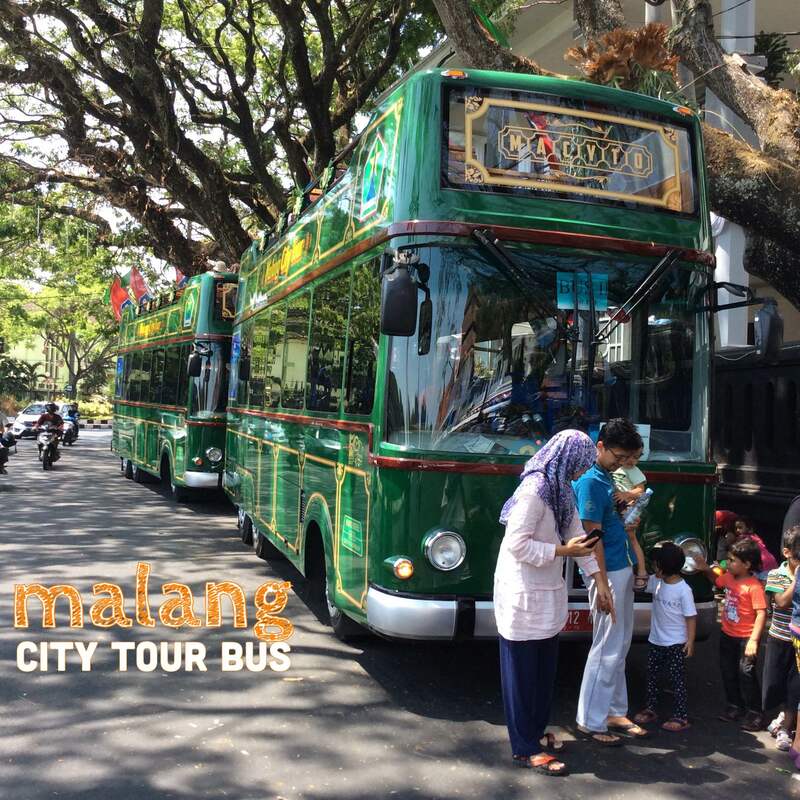 Malang City Tour bus had two unit and operated every hour in the weekend. Total time around approximately about one hour. So, interest to try this bus which also be called MACYTO? 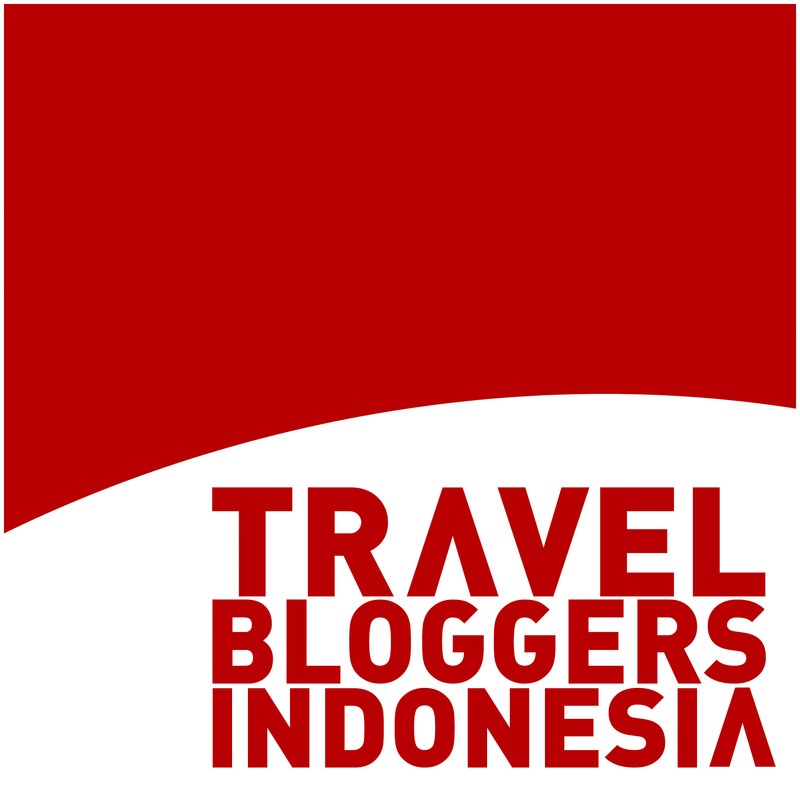 Come to Malang! mbak, itu kalo mau ikut harus registrasi dulu ya? atau gimana? iya, daftar dulu di petugas yang di balaikota itu. nanti dapat karcis..
brarti nanti bisa jalan-jalan lagi ya. iya laahh, deket ini masih satu pulau. 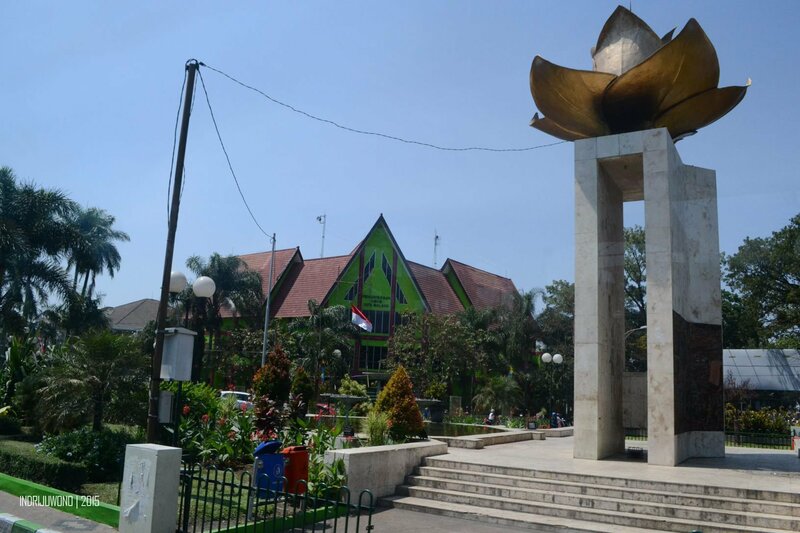 adanya di sekitar alun-alun Tugu, pagi aja. Sekarang naik BANDROS nggak segampang dulu. Harus reserve hari-hari sebelumnya. haduuhh, reribetnya ya mau naik bis doang. kayak bandung kurang hiburan aja. marai ngono yo mbok dolin malang, too..